Do you want to see everyone at your table sink into silence, occasionally interrupted by a contented sigh? Serve this cake and watch the magic happen. 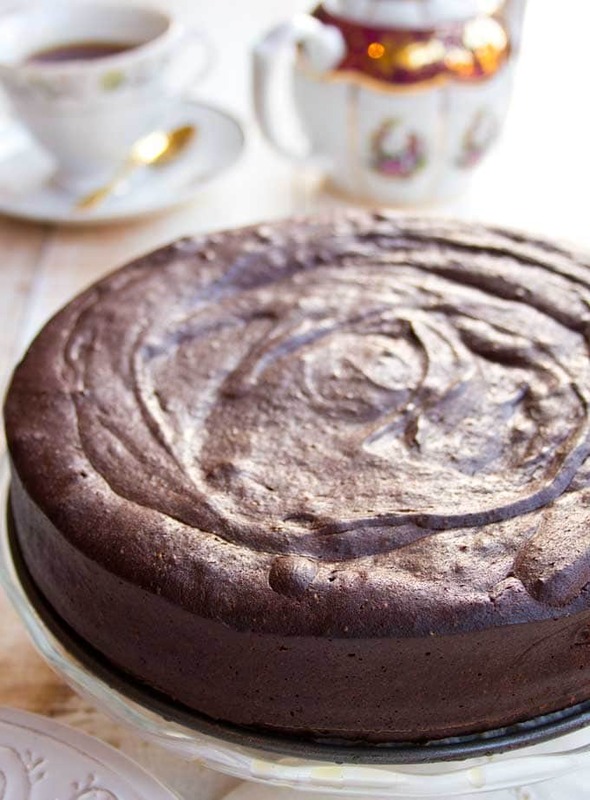 I love all the recipes I post on this site, but this sugar free chocolate cake recipe is special. That’s because it’s more than just a chocolate cake. It’s a crazy good, wonderfully rich, death by chocolate Keto chocolate cake. This cake does nothing by halves. It contains as much chocolate as it can possibly handle, a generous amount of grass-fed butter and it is just on the right side of sweet. Basically, it is a Keto dream dessert. As grains are a no-no on a Keto diet (as well as on a sugar free / low carb diet), most Keto cake recipes use either almond flour or coconut flour or both. This cake uses only a very small amount of almond flour, which makes it super fudgy, almost like a brownie. Friends, you’ll love it! Shall we get straight to the recipe? 1.) 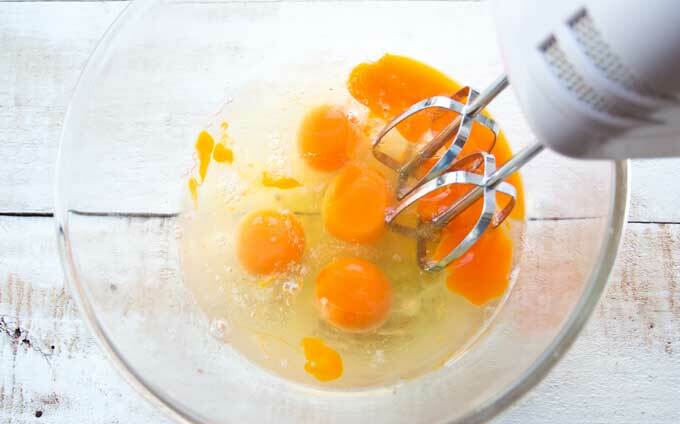 Whisk the eggs with an electric mixer until they have doubled in size and are frothy. 2.) Add the powdered erythritol and whisk again until well-combined. Tip: If you only have granulated sweetener, blitz it in a food processor or with the attachment of a stick blender to turn it into a powder. 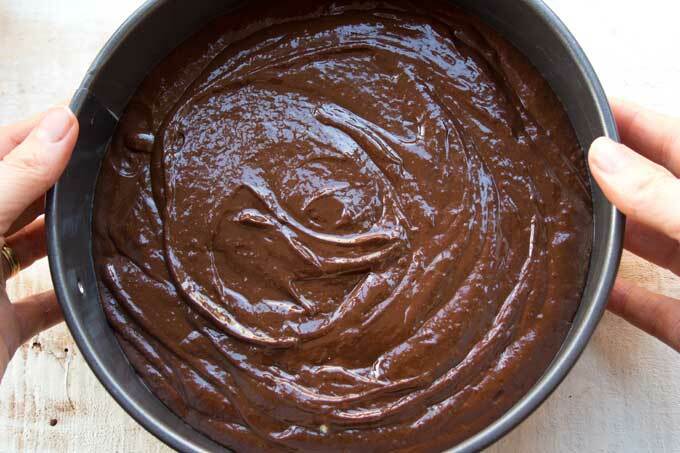 You don’t want any crunchy bits in your gooey, moist chocolate cake! TASTE the cake batter and add more sweetener if necessary. I don’t have much of a sweet tooth, so you may prefer it a little sweeter than I do. 3.) Melt butter and chocolate and stir until combined. You can do this in a microwave or on the stove – but slowly and gently. TAKE YOUR TIME!!! If the chocolate gets too hot too quickly, it can seize or separate. Then add the mix to the bowl and fold it in with a spatula or spoon. 4.) See how it’s slowly coming together? 5. And this is how it should look like – gooey, creamy goodness! 6.) Lastly, you add the almond flour / ground almonds and stir until they are evenly distributed. 7.) Get yourself a springform (I used a 20 cm / 8 inch) and line the bottom with parchment paper. Grease the sides with butter or oil and pour in the batter. Bake at 170 Celsius / 340 Fahrenheit on the middle shelf for 30 minutes. 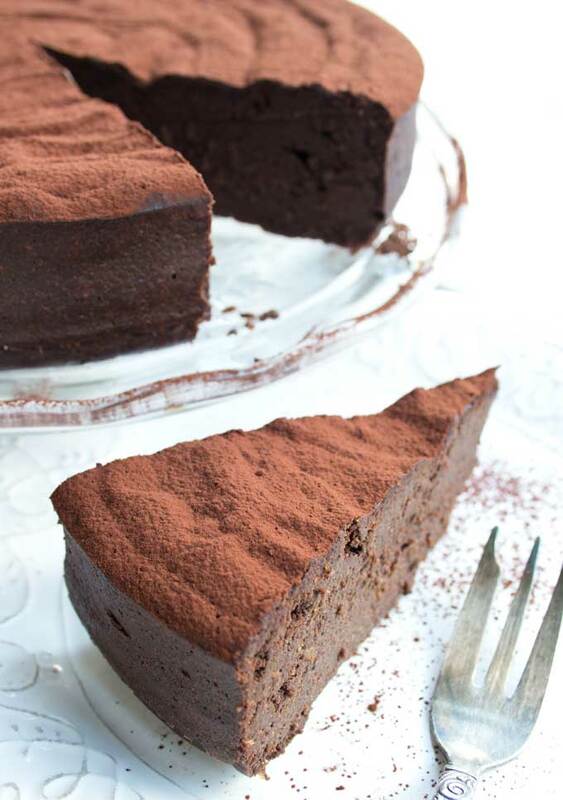 One thing I absolutely love about this low carb chocolate cake (apart from the taste!) is the fact that the recipe contains only 5 basic ingredients. This also means that these ingredients MUST be the best possible quality, especially the chocolate. Here in the UK there are a range of artisan chocolate makers which produce unsweetened chocolate. The brand I used, Montezuma’s, is available at Sainsbury’s, in organic shops or online. In the US you can go for a brand like Ghirardelli. I don’t recommend choosing unsweetened Baker’s chocolate for this cake. It has the tendency to seize when you melt it and simply does not taste as creamy and mellow as quality chocolate. Which brings me to my second recommendation: Take your time melting the chocolate! When you melt the butter and chocolate in the microwave, do so in 30 second bursts. Mine was mostly melted after 90 seconds in total. I then left the bowl on the kitchen counter and stirred it from time to time. This caused the rest of the chocolate to melt slowly. If you don’t have a microwave, you can melt chocolate in a water bath. For this, you either place the bowl with your chocolate and butter in a heat proof bowl over a pot with boiling water. 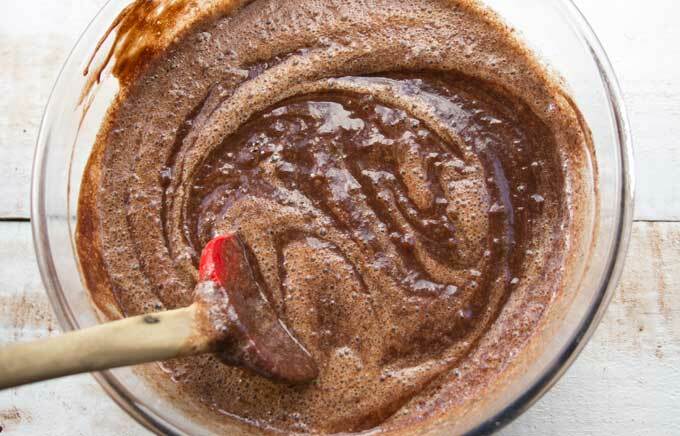 Once the chocolate is half-melted, remove the bowl and let it fully melt by stirring occasionally. If you are baking at high altitude, increase the oven temperature by 10 Celsius / 25 Fahrenheit. I think all chocolate desserts benefit from a pinch of salt, although this is entirely optional. To give your keto chocolate cake a festive vibe, you could add 1 tsp vanilla extract, 1 tsp cinnamon plus some cardamom, nutmeg and a pinch of cloves. For an extra kick, try adding a pinch of chilli! Add nuts for a bit or crunch – walnuts or pecans would work well. I’m a bit of a purist, so I simply dusted my cake with 100% unsweetened chocolate powder. If you want to go the whole nine yards, you could make a frosting (see recipe suggestion in the recipe notes below) or a quick chocolate ganache by melting 1 bar (100g) of chocolate and stirring in 3 tbsp of double / heavy cream and 4 tbsp powdered sweetener. You could serve this cake with a dollop of whipped cream or a scoop of sugar free vanilla ice cream. I used a 20 cm / 8 inch springform in this recipe. 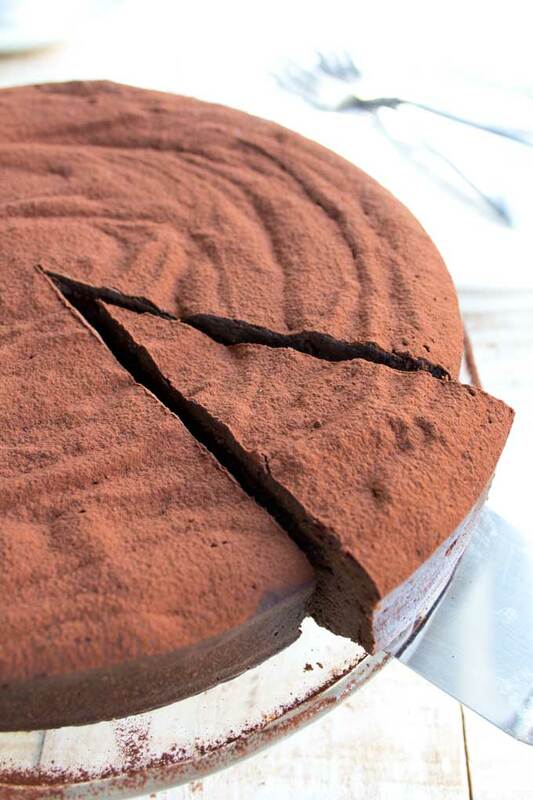 If you only have a standard size 25 cm / 9 inch springform, your cake will be a little flatter, but it still works fine. You may need to reduce the baking time by 5 minutes. Simply check after 25 minutes if the middle of the cake feels firm to the touch. You can freeze this Keto chocolate cake. Simply defrost on the counter! The ultimate keto chocolate cake recipe! 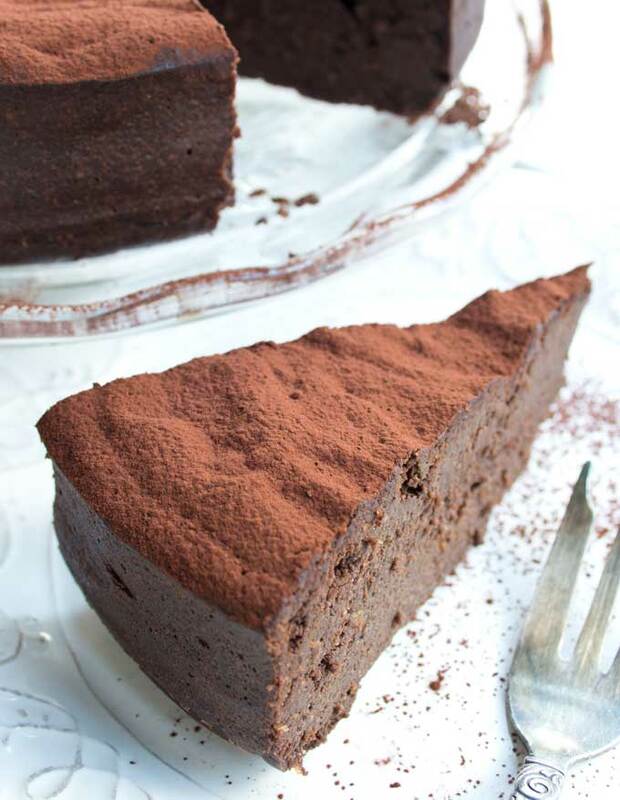 This decadent, fudgy cake is really easy to make and requires only 5 ingredients. Melt the butter and chocolate in the microwave (ca 90 seconds - see notes), then stir and wait until dissolved. Alternatively, gently heat in a water bath (a heat proof bowl placed over a pan of boiling water). Set aside. In a large bowl, beat the eggs until foamy, then add the sweetener and mix well. 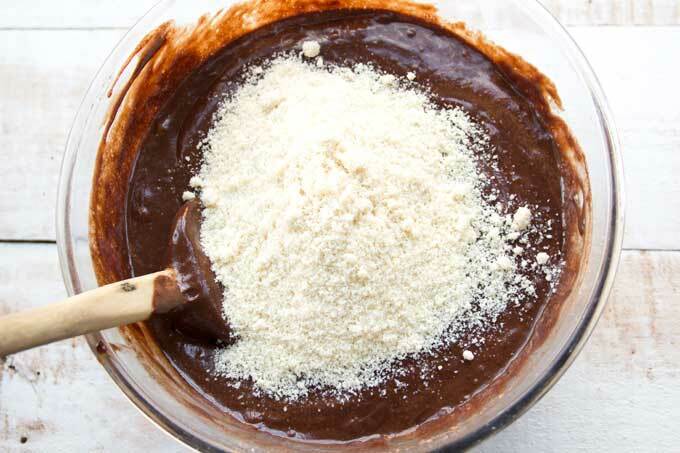 Add the melted chocolate and butter along with the almond flour and stir with a spoon or spatula until just combined. Line the bottom of a 20 cm / 8 inch springform with parchment paper and grease the sides with butter. Pour in the cake batter and bake for ca 30 minutes on the middle shelf until the top of the cake is firm to the touch, especially in the middle. Leave to cool before releasing from the cake tin. Once the the cake is completely cooled, dust with cocoa powder. Wait with dusting the cake until it's completely cooled. 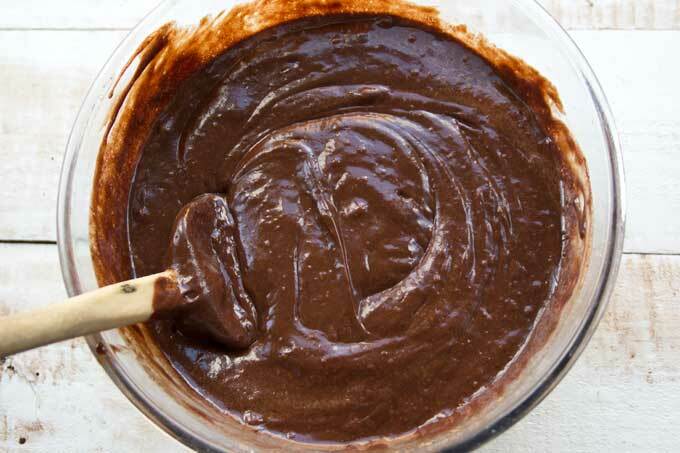 If it is still warm, the cocoa powder will melt and become sludgy. ***Use GOOD QUALITY butter and chocolate. If your products contain additives such as water or oils, you'll end up with fat separating and pooling on top of your cake. Check out the recipe variations in the post! Optional chocolate frosting: Melt 100g / 3.5 oz unsweetened chocolate and 60g / 1/4 cup butter, stir in 6 tbsp double / heavy cream and 1/2 cup / 50g powdered sweetener. Wait until it has cooled and thickened, then spread over the cake. I recommend using an erythritol-based sweetener for best results. If you use a different sweetener use the volume measurements stated as sweeteners vary in density. How should I change the recipe if I don’t want to use any sweetener? Maybe add a little more almond flour to make up for the missing bulk. I just made this cake and wow is it chocolate and rich! I’d say it’s like a truffle cake! I cover it in a thin layer of chocolate ganache and pressed in shredded bits of Lily’s chocolate to cover the whole thing and it looks so decadent! Hi April, I think it’s the Ghirardelli chocolate. I always use Montezuma 100% chocolate, which is readily available here in the UK, and used the nutrition from that. I’ve had someone else tell me the nutrition values for Ghirardelli are slightly different. I made this cake recently and loved it! Am wondering if anyone has tried this recipe as cupcakes instead? It should work just as well, why not? You might need to reduce the baking time a bit. I’d check it at 15 minutes and see if the tops are firm. Around 20 minutes should probably be long enough. Mine is darker and took much more time to cook. It was gooey for a good 40 min. in middle. A bit expensive for high end ingredients, fat content will make this serving bit size. I love the recipe, will try again. Practice is a good thing, and I am type 1 diabetic. When the kids love it, you KNOW it’s a winner! Unfortunately you can’t add a pic in the comments here, but I’d LOVE to see it – you can post it on my facebook page! Hi Katrin – I made this cake tonight and although it tasted great (a little sweet still for me) it took 1.5 hours before it was set properly and not liquid in the centre. It had a very thin crisp top but quite a thick, hard layer around the edges, however it did not stick to the pan. The only sweetener I could find was a blend of granulated erythritol and stevia, which I powdered as per your tip – could this have caused it to take longer to bake? Hi Adam, maybe you’re baking at high altitude? Then the recommendation is to increase baking time by 10 Celsius / 25 Fahrenheit. I don’t think the issue is the sweetener. Also, some ovens just aren’t the temperature they say they are, if your oven has seen a few years, it might be not 100% accurate. Could either be the case? I’m not sure what happened to mine but I used coconut flour in stead, its only now reading through comments I only needed half the amount. Mine came out with a lot of butter at the top looking watery, it is a little oily…I’m pretty sure I’ve done something wrong but OMY THE CAKE STILL TASTE AMAZING. Hi Sian, if you use grass fed butter and a good quality chocolate you don’t get a separation like that. I’m glad your cake tasted good though!! I was adding up the ingredients into my meal planning app and I calculated that using 1 1/2 cups of the powdered sweetener would add up to about 216 carbs and divided by 12 comes out to 18 carbs per slice just for the sweetener? I really want to try this but maybe I’m calculating something wrong? Hi Dani, erythritol does not get absorbed by our bodies, it passes right through. Therefore, I do not count the carbs in erythritol. Oh wow I did not know that thank you. That’s really helpful info! I’ve put it back in the oven. It’s been about 50 mins of cooking time. I think you should take it out, so the edges don’t burn. I’m not sure what happened – I once had someone with a similar problem and we established that it must have been the chocolate they used that separated as opposed to the butter. I chose this recipe because it’s the only keto chocolate cake recipe I found using chocolate rather than cocoa powder. I think I must have done something wrong, though, because when I tasted the batter before I put it in the over, it was the most bitter thing I had ever tasted. I ended up doubling the sugar and flour, and adding some almond milk and some whipping cream, so my version has more carbs. I think I used the wrong chocolate. I had a Ghirardelli 100% cocoa, no sugar chocolate bar (4 oz). Maybe I needed a smaller percentage of cocoa? You can get the Montezuma’s Chocolate Bars in America on Amazon.com, too. If your chocolate seizes, make sure NO water is getting in your chocolate either. For instance, if you wash your bowl right before using to make sure it’s as clean as possible, it must be completely dry and free of water before you melt chocolate in it, otherwise, your chocolate will seize. Fat and water don’t mix! My Chocolate seized when I mixed it with the eggs. INot sure why this happened. Ihave just put it in the oven but I am not sure this is going to work as the butter wa already separating when I put the cake in the oven. I just found you today. I am so glad I did. Your recipes really sound good, even though I have not made any yet, and I love your explanations and comments. I can hardly wait to test some of the dishes. The chocolate cake drew my eye. It will be one of the first, along with your bread recipe. Thanks so much. I will keep you posted on my success. Let me know how you get on Burch! I’m glad you found my site. Oh wow! Finally! 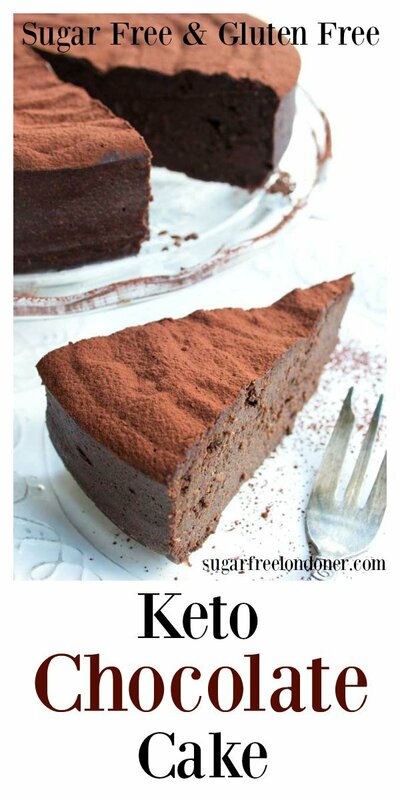 A chocolate keto Cake that tastes amazing. I followed the recipe exactly and dusted a mixture of cocoa powder and powdered erythritol on the finished cake. Simple and elegant. The next time I plan to add vanilla and cinammon for an interesting variation. I’m so glad you thought it was a success! I made this for the first time last night. This is going to be my gift to everyone from now on! I adjusted as follows: used the alt as suggested, added 1/2 cup cup of coconut flour. I also added 1 teaspoon of espresso powder, 1/2 teaspoon Hungarian sweet paprika and 1/2 teaspoon Vietnamese cinnamon, and 1 tablespoon KAF meringue powder. 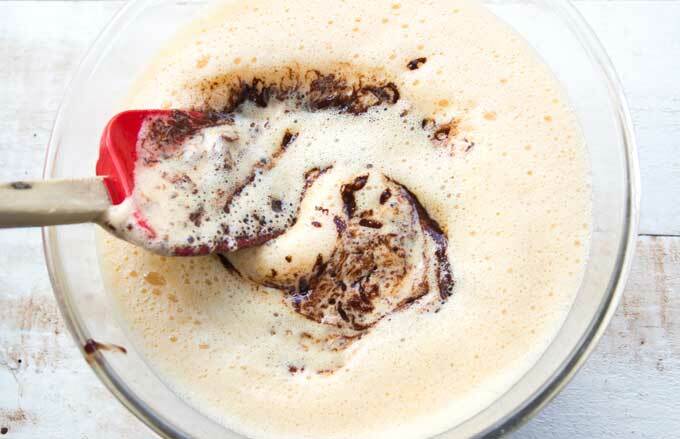 I used a hand rotary mixer that was mygrandma’s to whip everything into the frothy liquid. I used very high quality 90% chocolate bars and kerrygold butter, using the double boiler method on low and waited patiently. I used the powdered erythritol as suggested. I only have a 9” pan so that is what I used. I baked as directed BUT I always have a sheet pan in my oven with water in it to create steam. I had to bake four extra minutes. After cooled, I sifted KAF triple cocoa blend along with a little of the powdered sweetener all over the cake. It absolutely melted in my mouth. My husband loves it. I like the slightly crisp texture on the outside and cloud-like texture inside. I’d love to share my photo with you. BTW did I say that I am not a chocolate lover…until now! Wow! Thank you for listing all your tweaks! I love reading how others make my recipes their own. I’m glad you like the cake!!! Hi baked this today for Valentines, turned out pretty good but not as fudgy as expected. I did notice that when I took the cake out of the oven there was a lot of butter floating on the top that did soak back into the cake and also a lot of butter on the baking sheet (the cake tin is new, only the second time used) wondering if I over cooked it or something, cake ended up a little grainy – what do you think? Im not a very experienced baker and I have a tabletop oven which i don’t believe is the temp it says on the dial – if you get what I mean?!?! Hi Adrian, it’s possible that your oven temperature was too high – ovens can be temperamental. I think it may be the chocolate that has seized and separated into cacao butter and cocoa, rather than the butter. Make sure you melt the chocolate slowly before incorporating it and, in your case, try setting your oven temperature a bit lower next time. Will do thanks, I did melt the chocolate fairly slowly in a bowl over a hot pan of water. Would coconut flour be a 1:1 substitute? We are nut free, but can do coconut. I’d love to try this! I just want to make sure I can simply sub the coconut flour for the almond flour. If you use coconut flour instead of almond flour, you have to halve the amount. Coconut flour is more absorbent than almond flour, that’s why you need less. Thanks for the recipe, Im planing on making this cake tomorrow and I just realized that if I use 100%unsweetned Ghirardelli the net carbs per slice go up to 6 net carbs thats a lot! I already bought the ingredients so now I have to look for a more low carb friendly chocolate. I’m not saying its not a good recipe but maybe if others are in a very low carb diet should look for other chocolate options not Girardhelli. Thank you again for the recipe. Hi Paty, thank you for your comment. I’m wondering how how that’s possible if the chocolate is unsweetened? I used the Montezuma nutrition to calculate the recipe – surely the Ghirardelli cannot be much different. Can you send me a pic of the nutrition on the pack via email? Sure I can send a pic give me your email. I found another chocolate that had the nutrition closer to the one you used and the batter was delicious, I used monfruit powdered sugar I haven’t taste the cake cause its cooling down but I loved that was super easy to bake, I had the same issue with butter coming out on top but it was just a little bit and I’m pretty sure its my oven (not a very good one for baking) next time I will bake it a 330 or even 320. Can I substitute cocoa powder for the chocolate bar? Maybe increase the butter to compensate? Hi Linda, that’s a good question. My personal feeling is that it would be just too much butter, and it may end up too soft. Cacao butter has a finer taste than butter and it’s also firmer at room temperature. You’d have to increase the amount of almond flour to hold it together. Basically, you’d end up with a totally different cake. You’re probably better off searching for a recipe that uses cacao powder to start with. The only recipe you could use from my site are these chocolate cupcakes, which can be baked as a cake, or this chocolate mug cake, which readers have doubled and tripled to make a really fudgey cake – take look in the comments there! I am going to try that next time. I used Baker’s chocolate and texture was great but I will add more sweetener next time. Not sweet enough for us and had to cook over 10 minutes longer in my oven at 340°. Is the butter 1 1/3 cups before melted or after melted? Any tips or tricks or ideas for this type of outcome. Hi Blayne, this puzzles me. The eggs should cook at 170 Celsius/340 Fahrenheit and set the cake. The chocolate is firm at room temperature, and the butter makes it soft and fudgy. My best guess is that your oven was not hot enough? If the eggs can’t set your cake would remain liquid. Do you use your oven regularly for baking? I did a google search and egg whites actually begin to thicken at 150 F – much lower than the temperature I recommended….. quick thought – did you maybe bake at 170 Fahrenheit instead of 340 – I always give both temperature as I have readers all over the world? Do let me know. I’m so sorry though that the cake did not work out for your birthday. I do hope we can get to the bottom of it so you can make and enjoy it the way it’s supposed to look! Hello. I am planning to bake this cake, but I just noticed bought granulated erythritol, not powdered. Can I still bake the cake with granulated erythritol. Hi Consuelo, I’d definitely blitz your granulated erythritol in a food processor (or use the attachment of a stick blender) to powder it. 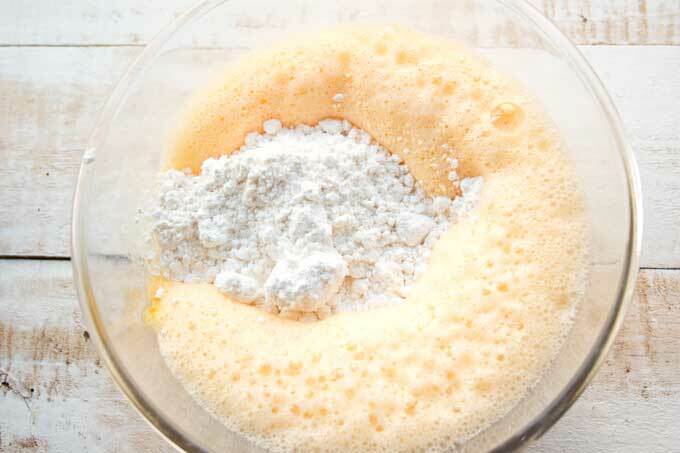 In cakes with a “cakey” texture or in cookies it’s fine to use granulated sweetener. This cake is really fudgy, so it’s better if the sweetener is as fine as possible. Erythritol has the tendency to re-crystallise a bit when cooled, that’s why. This Recipe is incredible, thank you so much. So easy to follow and Tastes amazing! I am new to this sugar substitute life style, so I didn’t know how sweet they were, so I followed the recipe, but after trying a little bit of the batter, to see if it was sweet enough, I found it way too sweet for my taste, so I added some cocoa powder. To keep it healthy, next time I’ll just put 1/2 cup of erythritol. Hi Lorena, I’ve actually made it with 1/2 cup of erythritol one and found it not sweet enough for me – but we’re all different. You did see the note in the recipe for all other sweeteners which are NOT erythritol-based and much lighter in weight (and therefore WOULD be too sweet if used by weight?) Thanks for your comment, it’s always useful my myself and other readers to know what other people think and how they alter the recipes to make them work for them. Can I use Stevia Pues sweetener in this cake please. I need to use a lot less so I don’t know if it’s gonna be too dry From that sweeter I really need maybe a teaspoon to make it really sweet. But I don’t know what the texture gonna be..
Is this pure stevia extract? I’ve never tried that, so I’m not sure, actually. Thinking about the recipe, it is the eggs and also the chocolate that bind the cake. The almond flour gives is a slightly cakey (=more fluffy) texture. From that standpoint it should not affect the recipe. You MAY want to add another few tbsp of almond flour to make up for the missing bulk coming from the erythritol. Let us know how it turns out! This is awesome! I added half a cup. Of sour cream and a pinch of baking soda also. I add sour cream to all my baking. I can’t help myself lol. It was to die for! My question is, are there any other variations of this recipe other than chocolate? Lemon perhaps? Or white chocolate from a jello sugar free pudding mix.? Thoughts? Can’t wait to hear how it turns out!!!! I recently upgraded my springform – I bought 3 different (smaller) sizes – and since then I’ve never had a problem with leakage. I think they close less well over the years. It’s one of those things we keep over decades and eventually age gets the better of them. Unfortunately this is one of the limitations of this recipe plugin I am using. I’m glad you noticed though. Hope you liked the cake! I just made this and blew it! First I had never used a springform pan and placed it in incorrectly so it leaked and smoked up the house. I also used stevia and a chart I had said to use 3/4 tsp stevia. It smelled good but was so rich and no sweetness to it. Do you suggest sticking to the Erythritol or how much stevia would I use? Will try again. We sooo need something here to snack as we are new to keto. Hi Debra, the tried and tested version is with erythritol, so that’s the version I can guarantee will work (unless you springform doesn’t play ball!!). If you prefer a cake that’s less rich, you could try making a cake using this chocolate cupcake recipe – it’s more cakey and less fudgy. i line the whole springform cake pan with baking paper and it’ll never leak. Can this be made with liquid egg substitute? I’ve never used it, but as long as your substitute is good for baking you should have no problem. Hello, I am about to attempt this cake and my only question is can I use Splenda instead of erythritol? Both have that powdered consistency, and I’d rather not make a special trip for 1 item. HI Will, if you use Splenda make sure you use the cup and not the weight measurements. Splenda is much lighter than erythritol. I love the idea of some chili in this recipe!!! I’m glad you like the recipe Sue! Oh how I wish I had read the comments before I attempted this.. brand new spring form leaked considerably while I was out of the kitchen.. house filled with smoke, etc. had to pull the cake out of fhe oven half way through..clean the oven etc By the time it went back in the oven it didn’t have a chance and had already sunken in. Onto attempt #2 stay tuned. .. I just did the same thing. Didn’t place the pan correctly together! Hello Poppy, I calculate the nutrition based on the exact ingredients I use, which I state in the post. If you use a different chocolate, the nutrition may differ. Made this tonight for my diabetic mother. It was INCREDIBLE – even the non-diabetics loved it. Thought it was a little on the sweet side so next time I’ll definitely cut back on the sweetner. Glad I read your recommendation about blasting the sweetner as I only found regular baking sweetner in the store (not powdered). I have just made this and taken it out of the oven. It looks and smells amazing. Will let you know if it tastes great. I added some vanilla, cinnamon and nutmeg and some chopped walnuts. Your tweaks sound delish. Definitely let me know!! Think looks and sounds amazing! Tonight we’re finishing off a keto cheesecake and tomorrow I’m baking this. My husband and I both love chocolate so it’s a no-brainer, and he doesn’t care if it’s keto or a diabetic’s nightmare as long as it tastes good I’ll come back to add a rating once I actually make it. Can’t wait to hear how you like the cake Sherry! It took me 2 tries , with the first in the trash, to make this cake. Unfortunately, my 8″ springform pan sprung a leak and most of the butter ended up on the bottom of the oven. On further inspection, the pan outer ring had a nearly imperceptible dent and caused enough of a gap to leak out the butter. The end result was a very dry, crumbly cake. While the oven was on self-clean mode, I ran back to the store and exchanged my springform pan for a new one, bought some more unsweetened chocolate and eggs, and went home to try again. This time I cut the parchment large enough to run it up the sides about 1/2″. I buttered the underside of the parchment before buttering the rest of the pan, poured in the batter, and baked for 30 minutes as the center was too sift at 25 minutes. It only leaked about 1/2 tsp, which is likely the butter from the parchment. I know springform pans aren’t waterproof (or butter-proof in this case), but I’ve never had one leak before. I usually only use them for cheesecake and never line the bottom with parchment. At any rate, the cake is super rich and chocolatey. I hope my husband will love it because it’s this week’s dessert! What an INCREDIBLE cake!!! I made it for a dinner party yesterday and everyone loved it. I served it with salted caramel ice cream. Such a treat! Do you think this would work with coconut oil or palm shortening instead of butter? Coconut oil has a similar consistency, so it should work. It will change the taste though. I have heard that if you get hold of refined coconut oil there’s no coconut taste, so this might be something worth trying out. I have never tried palm shortening so can’t help with that one. I made this cake according to your directions but the ingredients seemed to separate during baking and I ended up with a thin white bottom with chocolate on top. Also, it took an additional 15 minutes for the centre of the cake to cook, resulting in a hard, burnt edge. I really wanted this recipe to work out. Help! Hi Rita, how disappointing! I’m sorry your cake did not turn out. I have never heard of ingredients separating in this recipe. To me it sounds like it may have something to do with the kind of chocolate you used, as this is the main ingredient. Maybe it was not suitable for baking? I’d be really interested to hear what the brand was and what ingredients it has. Cheaper brands use vegetable or palm oils instead of cocoa butter, and they may have caused the separation? Hi Donna, as you have used the same chocolate as me I’ve done some research now. The reason may be that you need to heat the chocolate slowly and gently. Heating it too quickly and too much can cause the cocoa butter and cocoa to separate. I’ve added this info to the recipe and really hope you’ll try the recipe again. By the way, have you tried the Montezuma 100% chocolate with orange nibs? It’s the best tasting unsweetened chocolate ever (it actually tastes great all on its own) and I bet it would be amazing in this cake. Wishing you a happy Christmas, despite the mishap with the cake, and thank you for supporting Sugar Free Londoner. P.S. I did see the orange one in the shop and did think it would be amazing for the cake. Will try it next time! Donna, that’s great news! I felt so bad for you because at Christmas you want your dessert to be a showstopper. Thank you for taking the time to reply. Hi! Will this work with 1tsp pure stevia extract? Hi Katrin. Thanks for replying. Sweetness level I am not worried about. I was more concerned about structure; if the powdered sweetener added structure. Does it do anything to hold it together? I realize it’s bulk and sweetness, but I also wonder whether it does anything to keep it all together. If you know, let me know. Otherwise, I will experiment and let you know if it worked! Hi Monika, it would be a bit of an experiment. I’d say it’s mainly the egg and the chocolate plus the butter that hold the cake together. To make up for the missing weight/texture of the sweetener I’d add a little more almond flour as mentioned, just in case. I’d be so interested to hear how it worked out! Amazing cake! Such a treat- we all loved it. Rapeseed oil will stay liquid at room temperature whilst butter firms up. I think the cocoa butter in the chocolate and the egg will probably be enough to give firmness, so my guess is that it will work. Your cake might be a bit softer, so definitely keep it in the fridge. Do you normally replace butter with rapeseed 1:1? Do you know of any other gluten free flour that would work for this that is not a nut flour or coconut. I have a kiddo with a nut allergy and we are trying to make a Keto diet work for all of us. That’s a good question. you could try replacing with 4-5 tbsp flaxseed meal or psyllium husks. Or maybe 2-3 tbsp psyllium powder. Or sub the almond flour for chickpea flour. It’s not low in carbs, but it is gluten free and high in protein and as you’re only using a small amount calculated across 12 slices you’re probably still Keto. I did not see what the serving size is. Would you tell me please? Hi Rebecca, I cut my cake into 12 slices. The nutrition is calculated per slice. Hope this helps! I shall regain my composure and complete my findings later….